Cat Lady Embroidery: 380 Ways to Stitch a Cat does what it says on the tin. It has full-colour pictures of different cat-related embroidery designs, some realistic, others more cartoonish, and in different styles such as folk art. There are also border and corner motifs. The back of the book has the patterns and stitch guides and a brief rundown of embroidery and the tools and materials you will need. There is also a gallery of project ideas showing you the sorts of things you could do with your finished embroidery. 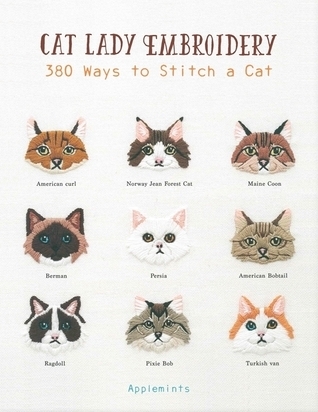 This book would probably not be suitable for a complete beginner to embroidery, but it would be a great addition to a keen embroiderer's library, especially if they are also a cat lover. Disclaimer: I received a complimentary copy of this book from Quarto Publishing Group, via Netgalley, in exchange for an honest review.